Buy 1 Get 1 FREE Subway Sandwiches! Get Buy 1 Subway Sandwiches & Get 1 FREE during the month of April! At participating Subway’s you can get a FREE 6? Sandwich with the purchase of a 6? sandwich anytime before 9 AM. Darlin’ Deals has teamed up with Super Frugal Stephanie and a ton of other great Bloggers to spoil our Fans with a Cash Eggstravaganza Giveaway! Please follow the rafflecopter entries. Facebook is mandatory but Twitter is optional. The more entries you have the better! FREE $25 Walgreens Gift Card offer! When you transfer your prescription to Walgreens Pharmacy you can get a FREE $25 Walgreens gift card! You must print out a coupon to present at Walgreens when you switch your prescription in order to get the Gift Card. To get your coupon, login or register with Walgreens. You’ll be prompted to provide prescription details, including your current pharmacy, phone number, and name. You’ll then get the coupon for the FREE $25 gift card. Thanks Penny Pinchin’ Mom & Frugal Finders! Babies R Us Sale – Up to 85% OFF! Starting today through Sunday Babies “R” Us is having an in-store only weekend sale! You’ll get an EXTRA 30% off Clearance prices on clothing and shoes. Best of all NO coupon is required! In-store purchase only. Quantities limited; no rain checks. Final discount taken off original price. Clearance Pricing ends in 0 or 8. Excludes Dollar Shop items, and Converse, Nike, Puma and Skechers footwear. Clothing and shoes not available at all Toys”R”Us stores. Offer valid 3/30-4/1/12. FREE $20 eBay Gift Certificate offer! Get a FREE $20 eBay Gift Certificate when you sign up for a FREE trial of Netflix! Sign up for a FREE 1 Month Trial of Netflix, eBay will mail you a $20 Gift Certificate within 7 days of signing up. Thanks for the tip Gabriela Celeste Peñaloza Dillard! Reminder: RARE Walgreens 15-20% Off Coupon + My Purchase Details! As I mentioned yesterday, today you can get 15-20% Off at Walgreens with the printable coupon (below) This is a RARE coupon that is only available 1-2 times per year!! Print this 15% off all eligible store items and 20% off Walgreens and W brand products coupon to save a little extra on your Walgreens purchase on Friday 3/30. NOTE: Exclusions do apply, so read coupon carefully. 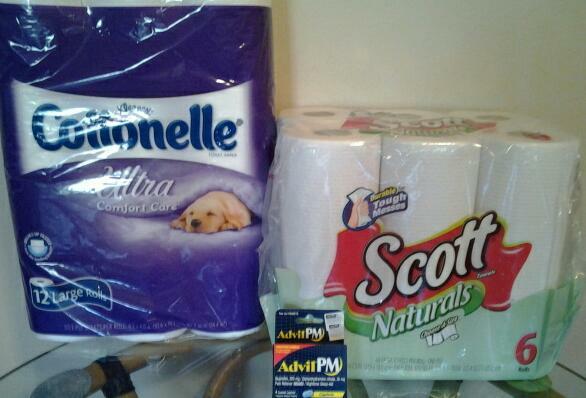 Here is what I bought using this coupon. My original total was $11.49, but I only paid $6.27 thanks to this coupon and manufacturer coupons. Advil PM 4 Count $1.49 – 15% Off Coupon = $1.27 – $1/1 Advil PM 4ct+ manufacturer coupon from inserts = $0.27! FREE $2 Amazon.com MP3 Credit = FREE Music! Get a FREE $2.00 MP3 Credit on Amazon! Follow the directions listed on the link above to get your $2 credit added to your Amazon account. There are tons of MP3 Albums starting at $1.99 which means you can score a Free album with this credit!! RARE Walgreens 15-20% Off Coupon! 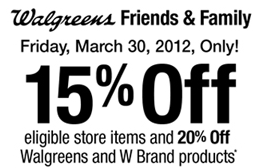 Tomorrow ONLY (3/30) you can get 15-20% off at Walgreens! Print this 15% off all eligible store items and 20% off Walgreens and W brand products coupon to save a little extra on your Walgreens purchase on Friday 3/30. NOTE: Exclusions do apply, so read coupon carefully. High value coupon for Honey Bunches of Oats = $0.99 cereal! 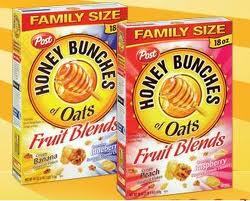 There’s a new printable coupon for $1.00/1 Honey Bunches of Oats Fruit Blends Cereal. Use zip code 43420 to find the coupon. Here’s a suggestion on where to use the coupon this week to get Honey Bunches of Oats for just $0.99 per box!! A fan recently asked me how to tell if a coupon is counterfeit and I thought this would be a great topic to post for all my Darlins to be informed. 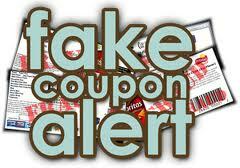 They are usually in PDF format (can be printed unlimited times & saved on computer) *A PDF coupon does not automatically mean it is fraudulent, many companies will directly release a coupon from their website in PDF format and that is a legitamate coupon. Just know/trust the source before printing it. The value of the coupon is unreasonably high value (example $8.00 Off Huggies Babies Wipes) *Companies rarely release high value printable coupons and if the high value coupon does not come directly from the company (newpaper inserts count) or printed from a legitamate website like Coupons.com, than it is most likely fraudulent. The coupon is not from a trusted source *Don’t print coupons that come from unknown sources, even if a friend sends you a coupon or link to a coupon (your friend may not know it is fraudulent) If you don’t know the source don’t print it or pass it on. Making fraudulent coupons is a serious crime, and there is a Fine/Jail Time as punishment for making or distributing Fradulent coupons.